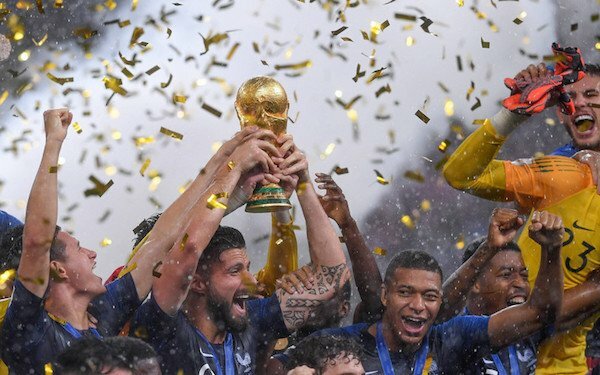 France won the World Cup for the second time when it beat Croatia, 4-2, in Sunday's final. Les Bleus were a frustrating team to watch as they liked to sit back and absorb pressure, attacking only occasionally. It would have been one thing if France was a team of modest talent, but it is a team chock full of world-class players. Still, Didier Deschamps' team is deserving World Cup champion. After doing the absolute bare minimum in the group stage, it rolled past 2014 runner-up Argentina in the round of 16 and then Uruguay, Belgium and Croatia (which had combined gone 15-0 if you include the two Croatia shootout wins). GK Hugo Lloris (Tottenham, England. Age: 31, Caps: 104). Father was a banker and late mother was a lawyer. Played tennis before concentrating on soccer at the age of 13. Grew up in Nice youth system. In final. Committed all-time keeper gaffe in a World Cup final, allowing Croatia's Mario Mandzukic easy tap-in. Fortunately, France was leading 4-1. Little thing: Long ball to Kylian Mbappe forced corner kick that led to second French goal. In tournament. Consistently came up with big saves. Biggest: late in first half against Uruguay, right after France took lead. In final: on Ante Rebic early in second half. RB Benjamin Pavard (VfB Stuttgart, Germany. Age: 22, Caps: 12). Grew up on the Belgian border in small town of Jeumont, from which French Ballon d'Or winner Jean-Pierre Papin hails. Followed in footsteps of father, a third division player. Joined Lille when he was 9, living with host families. Moved at age of 20 to Germany's VfB Stuttgart, where he plays center back. In final. Struggled to contain Ivan Perisic in first half, similar to problems he faced with Eden Hazard in semifinals. In tournament. Golazo against Argentina -- arguably, goal of the tournament -- turned things around for France. CB Samuel Umtiti (Barcelona, Spain. Age: 24, Caps: 25). Born in Cameroon and moved with his mother to Lyon region when he was 2. Enrolled in OL youth program at 9 and debuted with OL first team when he was 18. Sold to Barcelona for $30 million four years later. In final. Late in first half went down with pain to knee that had bothered him throughout the tournament but recovered to stay in game. In tournament. Started nervously -- dumb hand-ball cost France penalty against Australia -- but grew in confidence as tournament went on. Scored winner in semifinals against Belgium. CB Raphael Varane (Real Madrid, Spain. Age: 25, Caps: 49). Grew up on the suburbs of Lille in the north of France to a father from Martinique and mother from nearby Saint-Amand-les-Eaux. Joined Lens youth program at the age of 9, getting rides from his mother for the 90-minute round-trip. Transferred to Real Madrid at the age of 18 for $12 millions. In final. Struggled with Croatians' quick passing game in first half but was excellent in second half, especially in air. In tournament. Dominant in the middle of the French defense. Highlight: goal put French ahead against Uruguay in the quarterfinals. Became just 11th player to win World Cup and Champions League (European Cup) in same year. LB Lucas Hernandez (Atletico Madrid, Spain. Age: 22, Caps: 12). Born in Marseille but moved to Spain, where his father finished his playing career, when he was 4. Joined Atletico Madrid when he was 11 and debuted in La Liga at the age of 18. In final. Made great run, beating two defenders in Croatian half, and fed Kylian Mbappe for fourth French goal. In tournament. Similar run, deeper in Argentine end, set up Pavard's golazo. Youngest of five children born to a father from Angola and mother from Congo. Raised in the eastern suburbs of Paris and attended famed INF Clairefontaine, where a classmate was American keeper Quentin Westberg. Signed with Troyes at 16 and made pro debut at 17. In final. Had probably worst game of tournament. Biggest contribution: jumped and missed Antoine Griezmann corner kick that went off Perisic's hand for a penalty kick. In tournament. Returned to starting lineup against Peru after being dropped for opener and offered steadying influence. Had perhaps his best game with France in semifinal against Belgium. MF N'Golo Kante (Chelsea, England, Age: 27, Caps: 31). Born in Paris to immigrants from Mali and raised in the western suburbs of the city. Ignored by recruiters because of his small size. Signed with third division Boulogne at 19. After that, it was a meteoric rise: Ligue 2's Caen, Leicester City (which he helped win EPL) and Chelsea. In final. Early yellow card (for foul which led to first Croatia goal) threw him off his game and he never recovered. Subbed early in second half for Steven Nzonzi. In tournament. Only Varane had also played every minute of the first six games for France. Lived up to reputation as Mr. Clean, winning balls and frustrating opposing attackers. Candidate for tournament's MVP award until final. MF Paul Pogba (Manchester United, England, Age: 25, Caps: 60). Born to Guinean immigrants in the eastern suburbs of Paris -- two older brothers play for Guinea -- and joined Le Havre's youth academy at age of 16. Left for Manchester United two years later in a move that ended up in FIFA's courts. Later bolted United for Juventus but returned for then-world record transfer fee of $126 million in 2016. In final. Scored third goal with second bite at apple, firing a left-footed shot past Danijel Subasic after first shot with (preferred) right foot was blocked. Amazing thing: he had begun play seconds earlier with 50-yard cross-field pass to Mbappe. In tournament. Quietly -- as quiet as Pogba can be -- had monster World Cup, spraying balls between lines and shutting down midfield. FW Olivier Giroud (Chelsea, England, Age: 31, Caps: 81). Born in Grenoble, where he entered the local club's youth program at the age of 14. Spent five years in Ligue 2 or National 1 (third division) before breaking out at Montpellier. Has spent last seven seasons in EPL (Arsenal and Chelsea). Move to Chelsea in January was made to boost chances of making World Cup team. In final. Probably biggest contribution was effectively pleading case to Argentine referee Nestor Pitana that VAR should review Perisic handball. In all seriousness, kept pressure on Croatian center backs, considered its weak link, creating room for Griezmann and Mbappe. In tournament. Going seven games at World Cup without a goal is no shame for France's center forward. In 1998, starting center forward Stephane Guivarc'h also went scoreless. Giroud was essential part of French effort with defensive work, particularly on set pieces. FW Antoine Griezmann (Atletico Madrid, Age: 27, Caps: 61). Born to Macon, in central France, and moved to Spain's Real Sociedad when he was 14. Made pro debut at 18. Has spent last four seasons at Atletico Madrid, where he won 2018 Europa League. In final. All he did was have hand in first three French goals: free kick (following his dive) led to own goal, he took game-winning penalty kick (after three-minute delay for VAR) and set up Pogba's goal. In tournament. Finished with four goals and two assists to take Bronze Boot but did lots of little things to help out French defense and settle things with playmaking deep in French half. FW Kylian Mbappe (Paris SG, Age: 19, Caps: 22). Born to a father from Cameroon, his youth coach, and mother, a French league handball player from Algeria, in Bondy in the Paris suburbs. Attended the regional school in Clairefontaine before moving at 15 to Monaco, which beat out a host of big European clubs to sign him. Joined PSG on a "loan" in a $200 million deal last summer. In final. Became youngest player to score in final since Pele did it for Brazil at the age of 17 in 1958. In tournament. Had best individual game at the World Cup when he scored twice against Argentina and tormented La Albiceleste with his speed. Was the go-to player in French attack, putting fear in opposing defenses even if he didn't often see ball. Prime example: Rushed Domagoj Vida header of long Lloris pass to Mbappe in first half of final led to corner kick and second French goal.